This documentation refers to versions 0.9.0 or newer. The older 0.4.0 series of releases is documented here. Updated February 2, 2019 to clarify use of the preference option Scan only specific folders on devices. 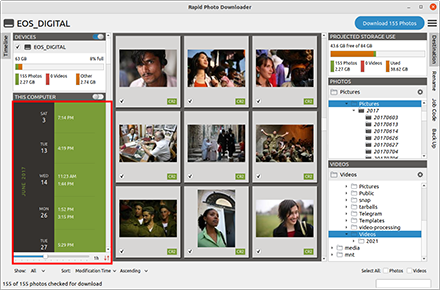 Rapid Photo Downloader imports photos and videos from cameras, phones, memory cards and other devices at high speed. 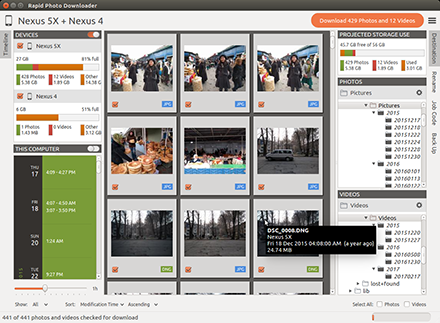 It can be configured to rename photos and videos with meaningful filenames you specify. It can also back up photos and videos as they are downloaded. It downloads from and backs up to multiple devices simultaneously. 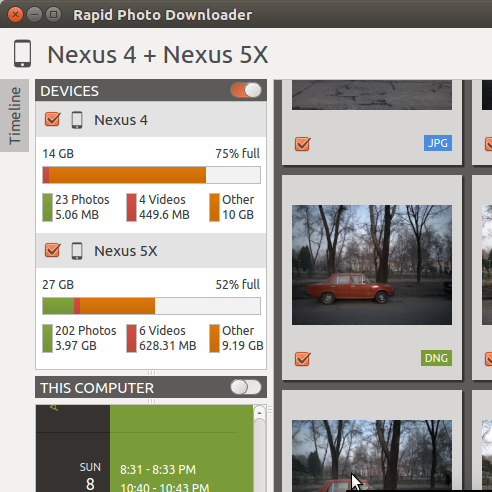 This documentation contains a description of Rapid Photo Downloader's features and how to make the most of them. If you notice any errors or have some suggestions for how it can be improved, please don't hesitate to let the author know. Work through the window from left to right. On the left are the download sources — where you'll be downloading files from. The left side also includes the Timeline, which shows dates and times your source photos and videos were taken. In the middle of the window are the thumbnails. 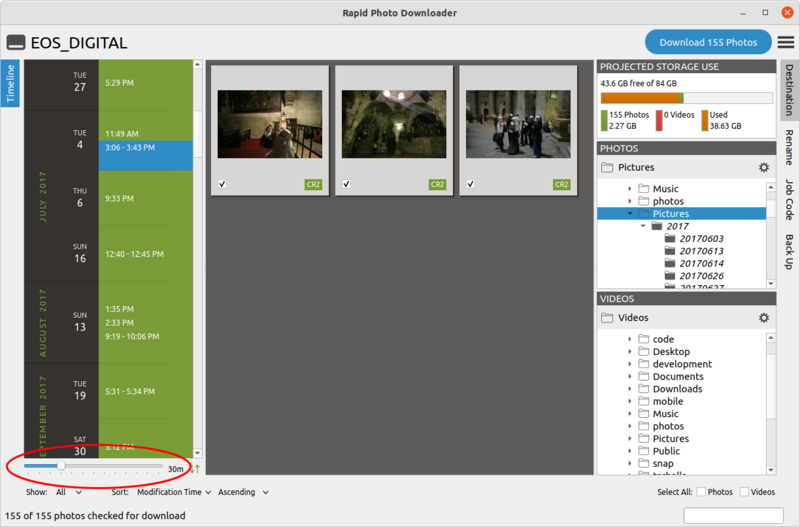 Use the right side to specify and preview where you want to download your photos and videos to — the destination folders. 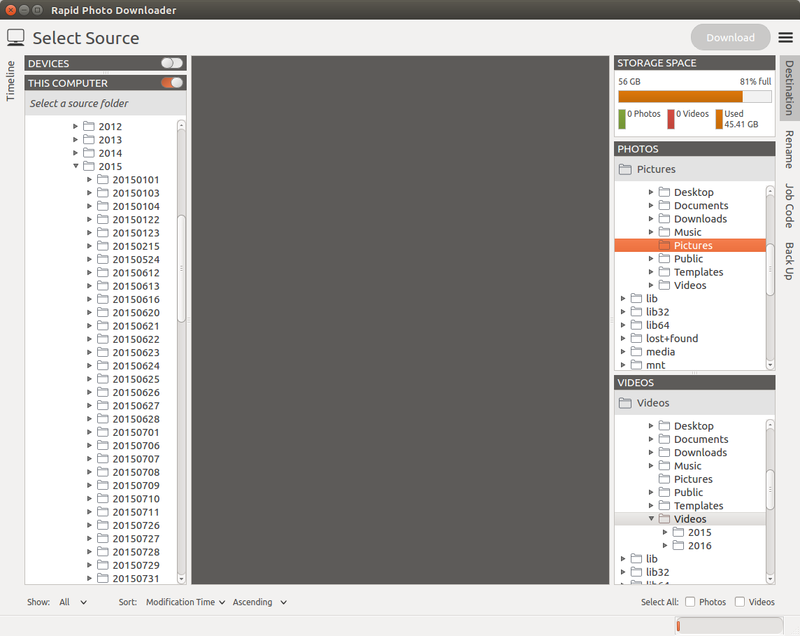 The right side is also where you specify how to rename your files and back them up as you download them. 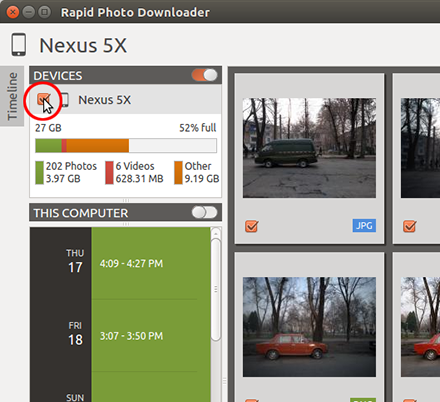 Rapid Photo Downloader downloads from two different types of sources: automatically detected devices, and from a folder on your computer. Each type has its own panel on the left side of the window. You can download from both sources simultaneously, or either one. Devices are things like cameras, smartphones, hard drives, memory cards and other things you can plug into your computer that contain photos and videos. You can download from multiple devices simultaneously — as many as your computer can handle at one time. You can plug in a new device at any time — before starting the program, after the program has started, or while a download has already started. Tip: In its default configuration, Rapid Photo Downloader looks for a DCIM folder in a device to determine whether it is a device from which to download. You can change this by adjusting the program settings. Tip: If automatic detection of backup devices is turned on, Rapid Photo Downloader will always check to see if it can use a device like a hard drive for backups before it will it will seek to use it as a device from which to download. 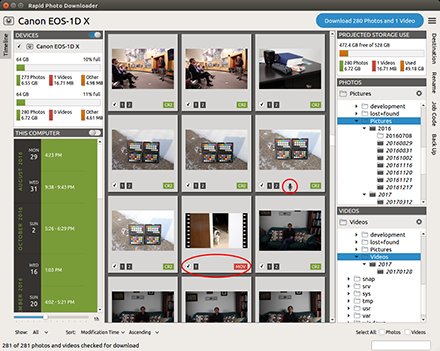 Unlike devices like hard drives or memory cards, when a camera or smartphone is plugged into your computer, only one program at a time can access it (the same applies to any MTP or PTP device). 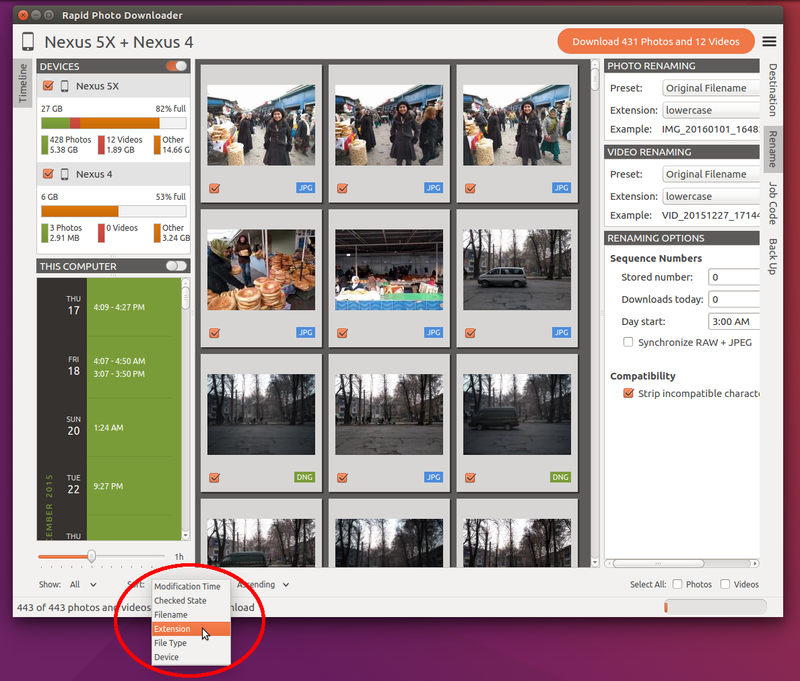 Because only one program at a time can access the camera or smartphone, if another program is using the it — Gnome Files, for example — where possible Rapid Photo Downloader will request the other program give up its exclusive control of it. For programs using Gnome technology (GVFS to be precise), that means "unmounting" the camera / smartphone. 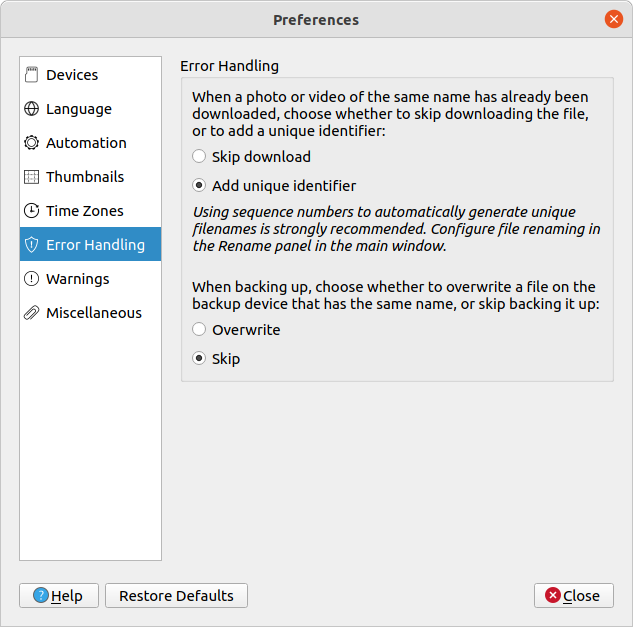 Unfortunatley KDE provides no mechanism for other programs to request a KDE program to give up exclusive access to the camera / smartphone, so if Rapid Photo Downloader cannot access your phone or camera, the only way to solve the problem when running KDE is to close and KDE programs that may have accessed it. You can download from smartphones, tablets, and other such pocket computers, provided they are supported by gphoto2 and are connected via a USB cable. 1Swipe down from the top of your device's screen. 2You should see the "USB for charging — Touch for more options" option card (or similar). 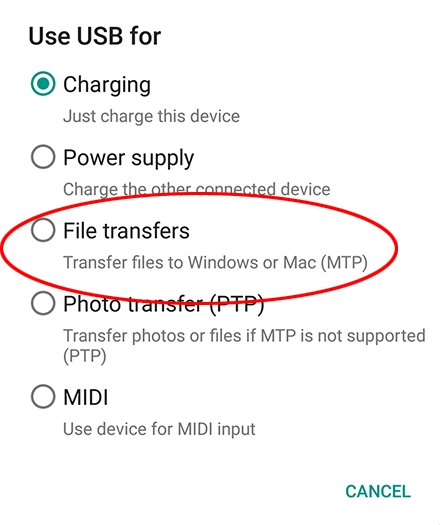 5Choose the option "Transfer files to Windows or Mac (MTP)"
Tip: If you download directly from the memory card using a card reader (and not the camera itself), exercise caution when downloading videos and audio annotations from dual card cameras. The Canon 1D series of cameras, for example, can be set to write duplicate photos to both memory cards, but they will not write videos or audio annotations to both cards. Instead, they will write the videos and audio annotations to only one card (note in the screenshot above tha the video is saved on only one memory card; the same is true of the audio annotation). If you mistakenly assume both cards' contents are identical to the other card, and you download only from the card without the videos and audio annotations, you may inadvertently not download them. To temporarily ignore a device means to ignore it only until the next time the program is run. To permanently ignore it is to blacklist it. You can specify a folder on your computer from which to download. Any photos and videos in its subfolders will be included too. In the picture above, the thumbnails circled in red are dimmed because they have been previously downloaded. If you want to download them again, you can check them for download by placing a checkmark beside them. The Timeline groups photos and videos based on how much time elapsed between consecutive shots. Use it to identify photos and videos taken at different periods in a single day or over consecutive days. To view photos and videos for a particular time range, use the mouse (optionally in combination with the Shift or Ctrl keys) to select time periods. When a time range is selected, the Timeline button on the left side of the main window will be highlighted. Tip: A download always includes all files that are checked for download, including those that are not currently displayed because the Timeline is being used. Tip: Sometimes the Timeline needs to be rebuilt as thumbnails are being generated or a download is occurring. The Timeline shows when shots were taken. The time a shot was taken is found in a photo or video's metadata. Reading the metadata is time consuming, so Rapid Photo Downloader avoids reading the metadata while scanning files. Instead it uses the time the file was last modified as a proxy for when the shot was taken. 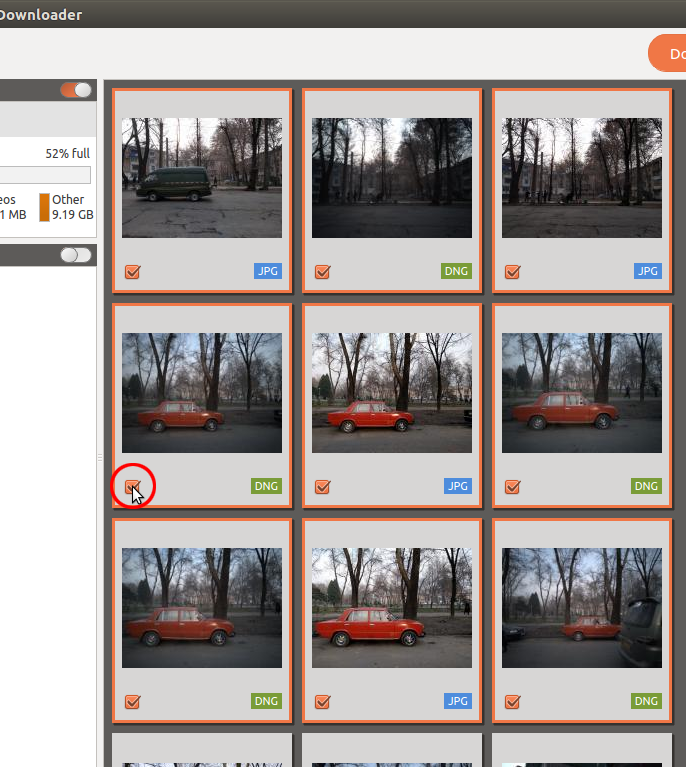 The time a shot was taken is confirmed when generating thumbnails or downloading, which is when the metadata is read. A file will only be downloaded if it has a checkmark. You can simultaneously apply a checkmark to multiple files — there is no need to manually place or remove a checkmark for each file. 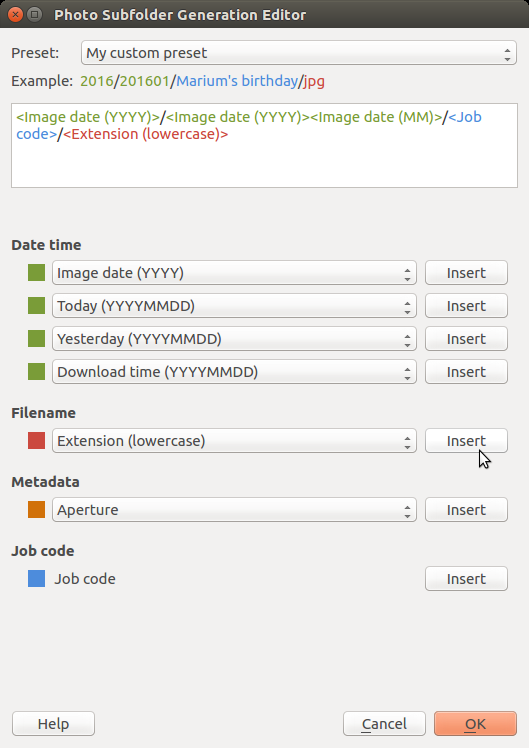 1 Modification Time: when the file was last modified, according to its metadata (where available) or according to the filesystem (as a fallback). 2 Checked State: whether the file is marked for download. 3 Filename: the full filename, including extension. 4 Extension: the filename's extension. 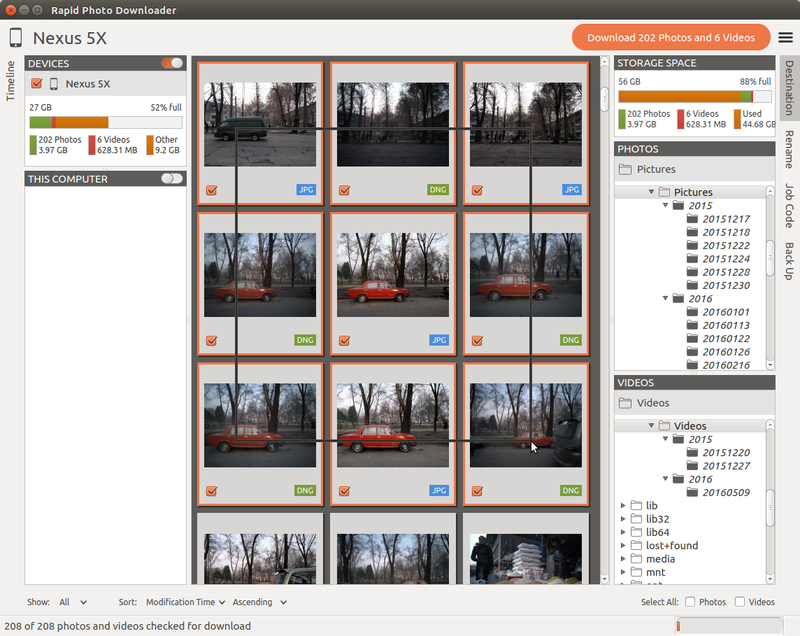 You can use this to group jpeg and raw images, for instance. 5 File Type: photo / video. 6 Device: name of the device the photos and videos are being downloaded from. Thumbnails are sorted by ascending or descending order. For options 2-6, the secondary sort order is by modification time. 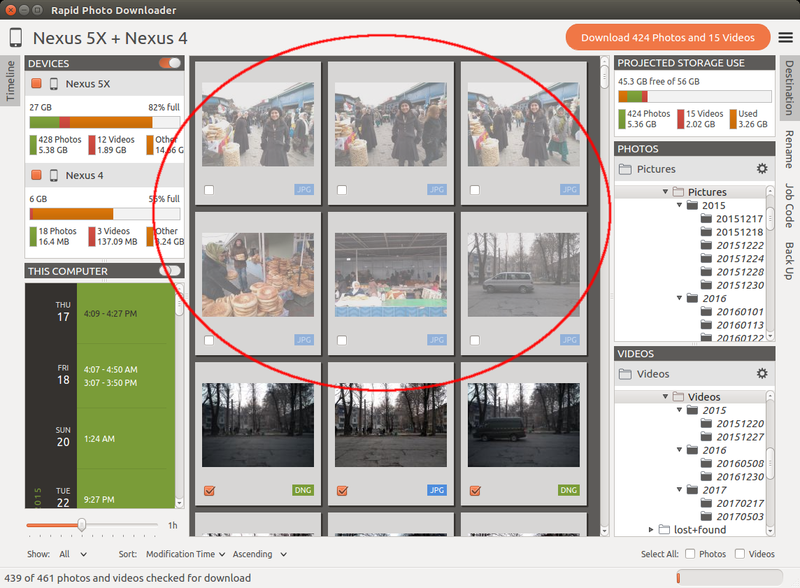 Tip: The sort order of thumbnails in the main window has no effect on the order in which photos and videos are downloaded. Photos and videos are always downloaded such that the oldest files are downloaded first, on a per device basis. 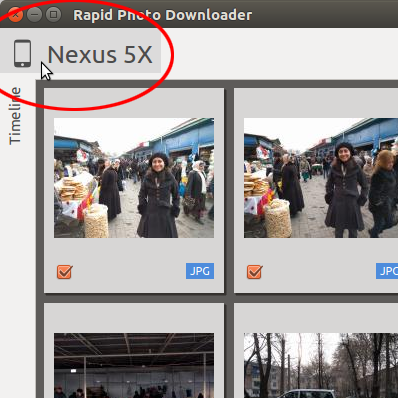 Rapid Photo Downloader can download from multiple devices simultaneously. For example you can download from one or more cameras at the same time, or one or memory cards, or any combination of them. It can also back up to multiple devices like external drives simultaneously, while it downloads. 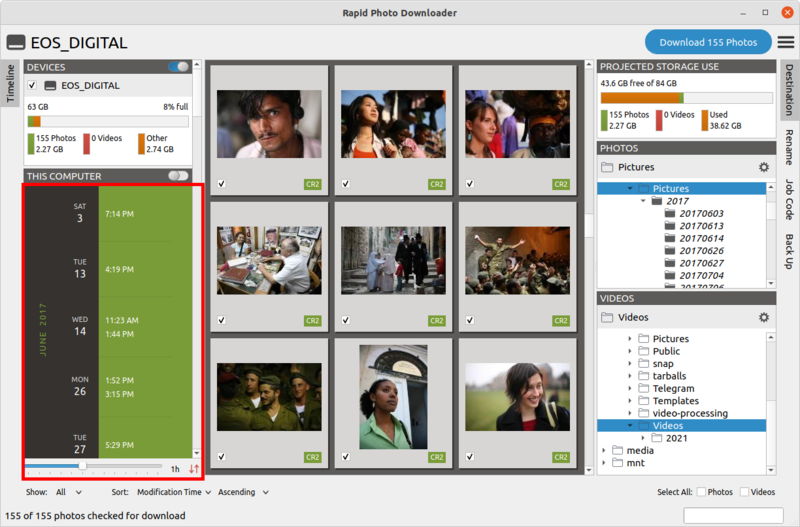 One of Rapid Photo Downloader's most useful features is its ability to automatically generate download subfolders and rename files as it downloads, using a scheme of your choosing. To specify where you want your files downloaded and how you want them named, open the appropriate panel on the right-side of the application window: Destination, Rename or Job Code. When storing your photos and videos on a computer, they are organized into a hierarchy of folders, called the directory structure. Before finalizing that directory structure for your photos and videos, choose wisely — plan on using the same directory structure scheme for many years! It's impossible to overempahsize how helpful it is to use a scheme that systematically and consistently places your photos and videos into a predictable destination. As the American Associate of Media Photographers put it, the photo and video directory structure "should be stable and scalable; it should not fundamentally change, only be added to". Devise a download destination scheme that takes advantage of Rapid Photo Downloader's ability to automatically generate download subfolders using file metadata, such as the date the photos or videos were created. You can also add text to folder names at the time of download. 1The Destination folder, e.g. "Pictures", "Photos", or "Videos". This directory should already exist on your computer. 2The download subfolders, which are directories that will be automatically generated by Rapid Photo Downloader. They need not already exist on your computer, but it's okay if they do. They will be generated under the Destination folder. You can download photos and videos to the same Destination folder, or specify a different Destination folder for each. The same applies to the download subfolders for photos and videos — download photos and videos to the same subfolders, or use a different scheme for each type. 1The Destination folder is in this instance "Pictures". The name of the Destination folder is displayed in the grey bar directly above the tree, with a folder icon to its left and an icon of gear to its far right. 1File metadata, very often including the date the photo or video was created, but might also include the camera model name, camera serial number, or file extension e.g. JPG or CR2. 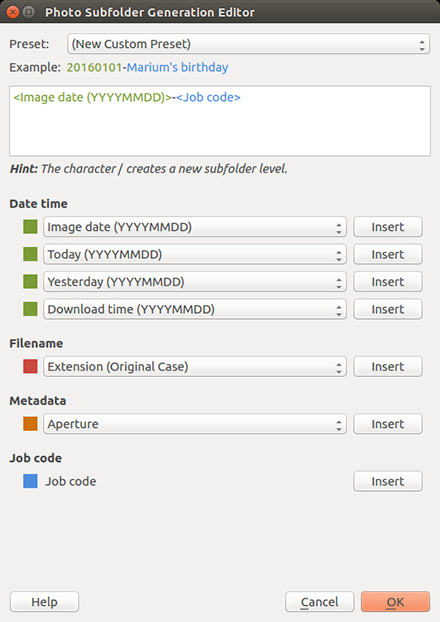 Naming subfolders with the year, followed by the month and finally the day in numeric format makes it easy to keep them sorted in a file manager. 2A Job Code, which is free text you specify at the time the download occurs, such as the name of an event or location. 3Text which you want to appear every time, such as a hyphen or a space. 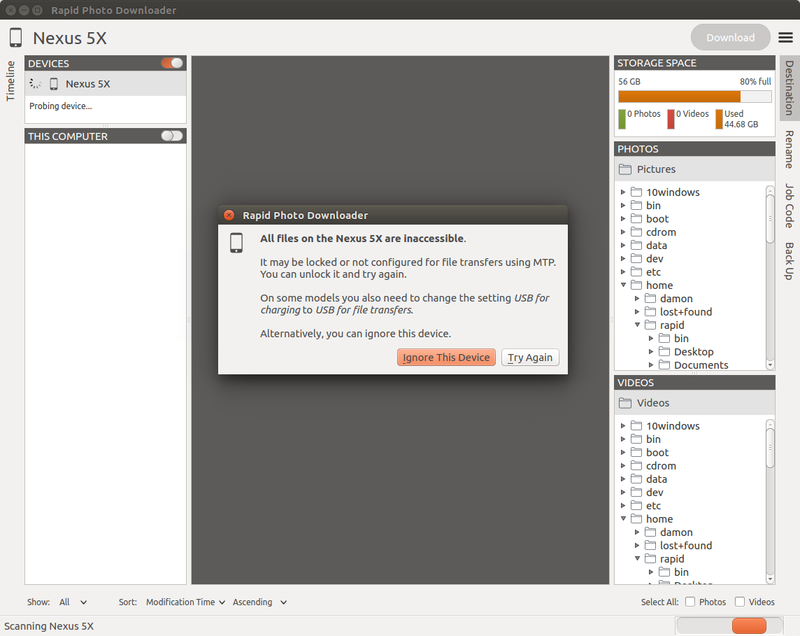 The image above shows a custom preset named "My custom preset". Tip: You are not limited to the built-in date/time choices. You can combine two date/time choices to generate new combinations. For example, the picture above illustrates combining year (YYYY) and month (MM) to form YYYYMM. Use Rapid Photo Downloader's file renaming feature to generate meaningful file names using criteria you specify. You are not limited to the default presets. Combine the following options to generate limitless variations. Tip: Put careful thought into choosing a worthwhile system for generating filenames, particularly if you store tens of thousands of photos or more. Ideally you should use the same naming scheme for decades. See Choosing Suitable Image Filenames below for helpful tips and best practices. The picture above displays a warning indicating the unique filenames may not be generated, because in this case the filenames are merely those genenerated by the camera. Most cameras do not generate unique filenames, so when you've taken enough photos or videos, it's inevitable that quite different photos and videos are going to end up with the same filename — which is far from ideal. Use the Renaming Editor to choose from among the following options (below). 3Download time: the time at which the download was started. If there is more than one device being downloaded from at one time, the time for the first device will be used. Tip: If subseconds metadata is not available in a photo being downloaded, that component of the filename will be ignored. Tip: If your preferred date/time format is not listed above, combine the options to fit your liking, e.g. YYYY-MM. 2Image number: The component of the filename which is made up of a series of numbers. These are the numbers which are automatically incremented by the camera (typically 4 digits in length). For example, the image number of the filename IMG_0524.CR2 is 0524. For a filename like VD1D7574.CR2, it is 7574. You can specify how many digits should be used: all of them, or the last one, two three or four digits. 4Sequence letter: like session numbers, but uses letters. 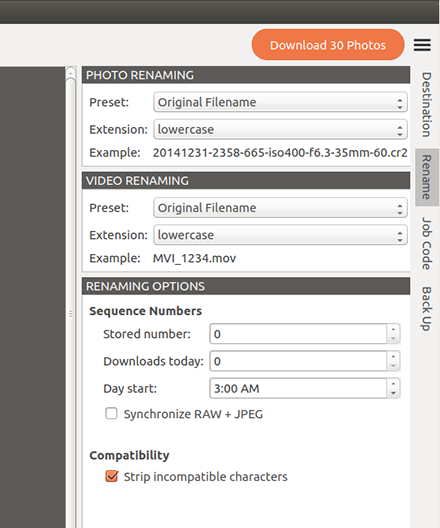 Renaming options affect photo, video and download subfolder names. You can also specify the time a day "starts". This is useful if you use the Downloads today sequence number and often photograph something late at night (e.g. concerts) and you want to start a download after midnight. Here you might like to specify that a new day to "start" at 3 a.m., for instance (which is the default). This option is useful if you use the RAW + JPEG feature on your camera and you use sequence numbers or letters in your photo renaming. Enabling this option will cause the program to detect matching pairs of RAW and JPEG photos, and when they are detected, the same sequence numbers / letters will be applied to both photo names. Furthermore, sequences will be updated as if the photos were one. For example, if 200 RAW photos and 200 matching JPEG photos are downloaded, the value of Downloads today will be incremented by 200, and not 400. The same goes for the rest of the sequence values, including the Stored number sequence number. 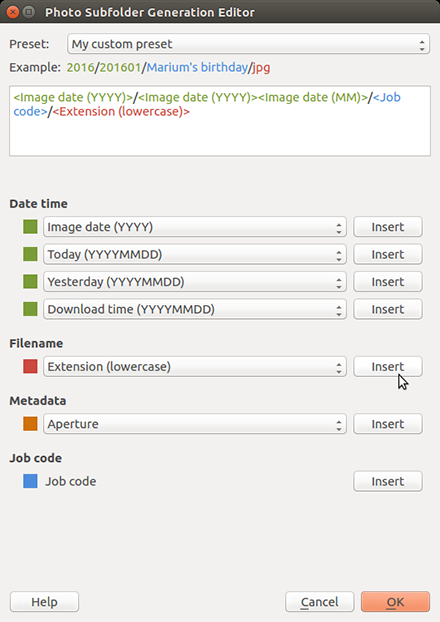 Matching photos are detected by comparing filenames, as well as the date/time exif values. 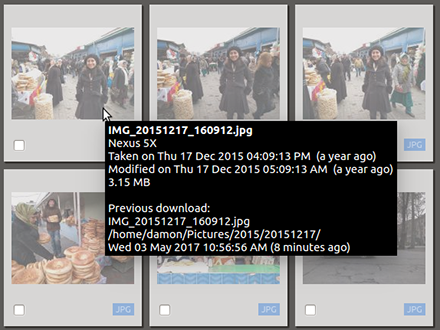 Tip: For photos to match, the date/time exif values do not have to match exactly. There is a 30 second leeway to allow for the time it can take for a camera to write a file to its memory card(s). The Synchronize RAW + JPEG option will take effect regardless of whether the RAW and JPEG photos are stored on different memory cards or the same memory card. Furthermore, if they are stored on separate memory cards, you can download from them simultaneously or one after the other. The only requirement is to download the photos in the same session — in other words, for the feature to work, use as many memory cards as you need, but do not exit the program between downloads of the matching sets of photos. 1Duplicate files: when two files with the same file name and the same date/time exif values are encountered, an error occurs. How the error is handled depends on the program's configuration. If Error Handling is set to Skip download, the duplicate file is not downloaded. If Error Handling is set to Add unique identifier, the file is downloaded, assigned the same sequence number as its duplicate, and has an identifier added to the end of the file name. 2A mismatch in the date/time values between otherwise matching pairs: if two files have the same name, e.g. IMG_1234.CR2 and IMG_1234.JPG, but differing date/time exif values, an error occurs. The program logs an error report, but both files are nonetheless downloaded and assigned matching sequence numbers. 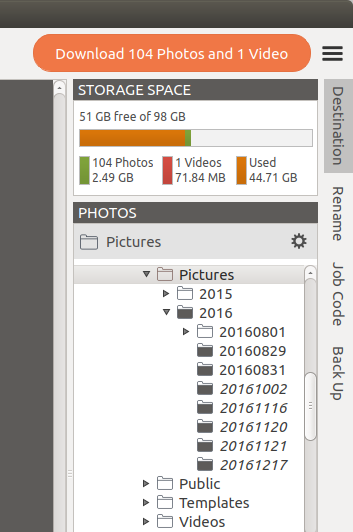 Tip: If you work with many photos — particularly RAW files — and videos you may find that your computer's capacity to store all of these files is overwhelmed. In such cases, your workflow will probably involve some kind of system where you have two copies of each file being stored on external drives or some other kind of backup medium. Backing up to two devices simultaneously is helpful for workflows of this kind. Backup devices are automatically detected by scanning devices to see if they contain either of the names specified in Photo folder name and Video folder name. In the illustration above, the drive photobackup does not contain a folder named Videos, so videos will not be backed up to it. 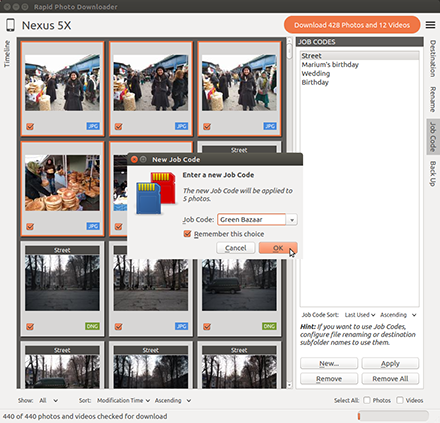 Job Codes let you easily enter text that describes sets of photos and videos. You can use them in subfolder and file names. If you want to use Job Codes, configure file renaming or download subfolder names to use them. You can apply new or existing Job Codes before you start a download. If there are any files in the download that have not yet had a Job Code applied to them, you'll be prompted to enter a Job Code for them before the download begins. 1An image cache whose sole purpose is to store thumbnails of files that have not necessarily been downloaded, but may have. It is called the Rapid Photo Downloader Thumbnail Cache, and is only used by Rapid Photo Downloader. It is typically located at /home/USER/.cache/rapid-photo-downloader/thumbnails/. (The actual location may vary depending on value of environment variable XDG_CACHE_HOME). The thumbnails are saved as jpegs using 75% compression. If a file in the cache has not been accessed for 30 days, it is deleted when the program exits. 2A temporary cache of files downloaded from a camera, one for photos and another for videos, which are used to extract thumbnails from. Since these same files could be downloaded, it makes sense to keep them cached until the program exits. They are located in a temporary subfolder in the download destination. 3The freedesktop.org thumbnail cache, in which Rapid Photo Downloader stores thumbnails of RAW and TIFF photos once they have been downloaded. Programs like Gnome Files, Nemo, Caja, Thunar, PCManFM and Dolphin use this cache too, meaning they will display thumbnails for those RAW and TIFF files as well. While generating these thumbnails does slow the download process a little, it's a worthwhile tradeoff because Linux desktops typically do not generate thumbnails for RAW images or large TIFFs. Finally, if the path files are being downloaded to contains symbolic links, a thumbnail will be created for the path with and without the links. Rapid Photo Downloader uses its own dedicated Thumbnail Cache because it makes the display of thumbnails almost instaneous for devices that have previously had their thumbnails generated. While useful in many workflows, it's not useful if you always download all shots from a shoot and never keep the downloaded shots on the camera or its memory cards. In this workflow, using the Thumbnail Cache slows down rather than speeds up Rapid Photo Downloader. For such a workflow, it's better to disable the Thumbnail Cache, which you can do via the Program Preferences. The Restore Defaults button restores default values only for those preferences currently displayed in the Program Preferences dialog. 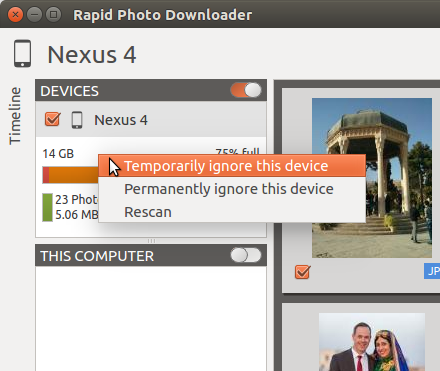 By default, Rapid Photo Downloader scans for photos and videos only on devices that are external to the computer, including cameras, memory cards, external hard drives, and USB flash drives. Turning off this setting means that any mount point listed in /etc/fstab (excluding / and swap) has the option of being scanned as a device. 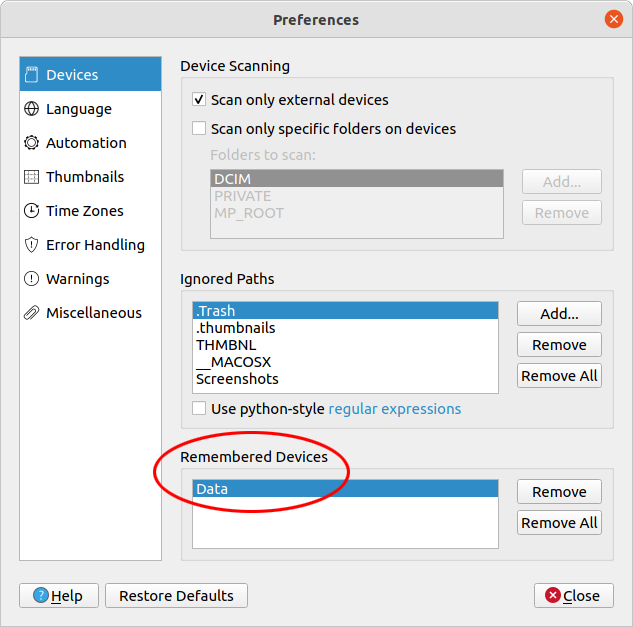 By default, the program will only scan the folders DCIM, PRIVATE, and MP_ROOT on external devices like cameras and memory cards, but you can change these defaults by adding or removing folder names. This is particularly useful for camera and phone manufacturers whose devices save photos and videos in locations that differ from the DCIM specification. These folders must be at the base of the file system. For instance, if the phone saves its pictures into a subfolder "Camera Roll" within the folder "Pictures", you must specify the "Pictures" folder be scanned. The reason for this is technical — on some devices, certain folders are not meant to be read via MTP, and attempting to do so will cause the connection to the phone to freeze. Tip: With smartphones, scanning the entire device is generally a bad idea, leading to poor performance. For example, if you do not wish to download photos and videos from the subfolder Camera, simply add the value Camera to the list of ignored paths. There is no need to specifiy the entire path. If you want to undo a choice you previously made about devices to always ignore or download from, you can remove it from the list of Remembered Devices using the Remove or Remove All buttons. 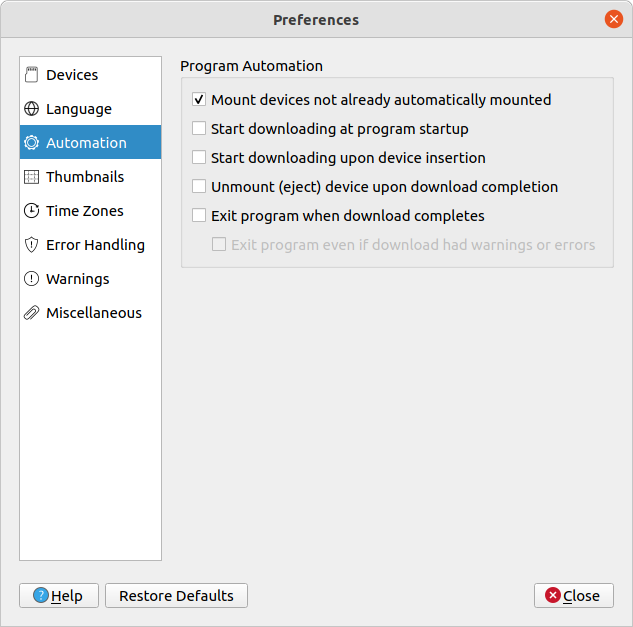 3Unmount (eject) device upon download completion allows you to remove a device from your computer as soon as photos and videos have finished being copied from it. By default thumbnails are shown in the program's main window. You can speed up the download process by turning off thumbnail generation, which will also inhibit the generation of system thumbnails. When a thumbnail is generated, by default the program stores it in its Thumbnail Cache. In some situtations, it makes sense to disable the Thumbnail Cache. While downloading, the program can save thumbnails that are displayed by desktop file managers and other programs. This setting changes the number of CPU cores used to generate thumbnails. Thumbnails are generated asynchronously and in parallel, using a load balancer to assign work to operating system level processes utilizing up to this number CPU cores. It is recommended to leave this value at its default setting. (Consult the FAQ to understand why generating thumbnails for photos on smartphones is painfully slow). You manage the size of the Thumbnail Cache by adjusting its settings, which is useful if you are running low on disk space. Caching thumbnails that have not been accessed for thirty days is a sensible default, but you can change it to anywhere between zero days and three years. Purging the Thumbnail Cache means deleting all its thumbnails. Optimizing it means optimizing the sqlite3 thumbnail database, as well as ensuring the database and all its thumbnails are in sync with each other. 1Downloading files currently not displayed: when viewing a range of times and dates in the Timeline, or displaying only new files, it's possible to mark files for download that are not currently displayed in the main window. When enabled, the program can warn you about this before you start the download. 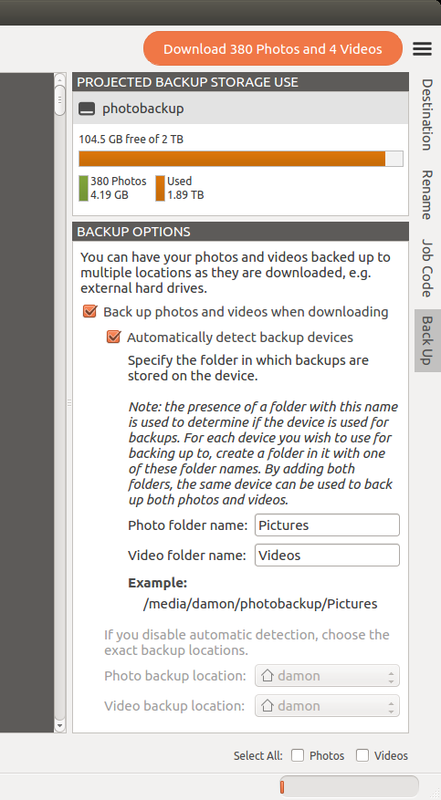 2Backup destinations are missing: when backups are enabled, the program can warn you when it's not possible to back up because the backup destinations are unavailable. 3Program libraries are missing or broken: warn if a software library such as libmediainfo is missing or not functioning. 3Filesystem metadata cannot be set: when writing to filesystems like NTFS, sometimes it's not possible to adjust a file's filesystem metdata (such as its modification time). If enable, the warning will appear as a report in the Error Report, with a maximum of one report per filesystem destination. 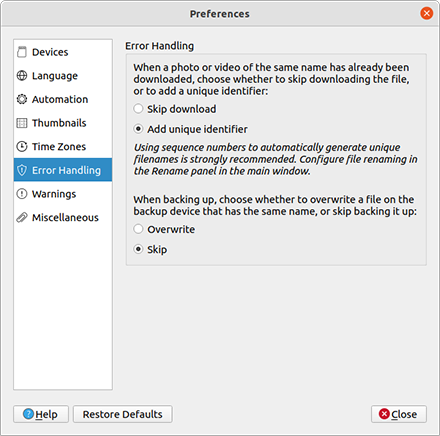 5Encountering unhandled files: warn after scanning a device or this computer if there are unrecognized files that will not be included in the download, with the exception of files with the filename extensions shown. If you add a file extension, there is no need to include the leading period (dot). When enabled (the default), the program checks for a new version each time it program starts. You can turn this feature off if you prefer. However, if you are running a development release (an alpha or beta release), the check cannot be turned off. If running a stable version (i.e. a release that is not an alpha or beta), you can specify whether to include development releases in your version check. Use this setting to ignore DNG date/time metadata when downloading from MTP devices (like cellphones and tablets). When it is ignored, the DNG file's modification time is used instead. Many (if not all) Android 6 and 7 devices create bogus DNG metadata values. 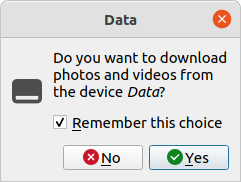 When a download device is inserted and downloaded files are already in the main window, the default behaviour is for the program to ask if the completed downloads should be cleared, or displayed alongside the files from the new device. 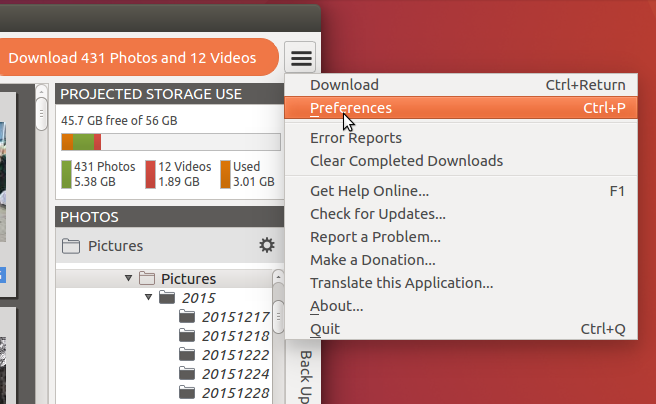 You can set the program's behaviour to clear the thumbnails of the completed downloads, keep them, or to prompt you. 1Nothing except the extension of a camera generated filename is important enough not to replace with something better. 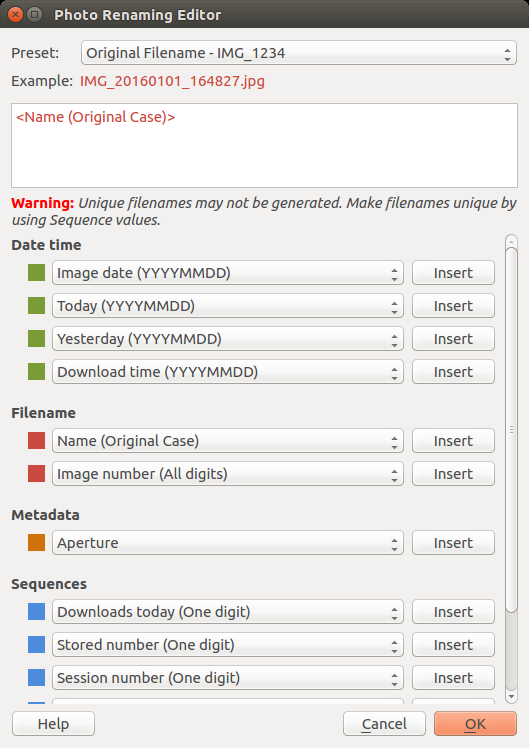 2Unique names mean you will never be confused as to which file is which — use Sequence values like Downloads Today to make filenames unique. 3Consistently including a classification component in the filename, linked to the subfolders it is stored in, makes it easy to locate whenever one of its derivatives is on a website or with a client. 4If exposure information is useful as you evaluate the quality of photos—for example, "was the shutter speed dangerously slow, or was a high aperture used? "—then consider making photo metadata a prominent part of the filename. 1Ensure unique filenames are generated. 2Use as many card readers as practical. 3Set the option Start downloading upon device insertion. 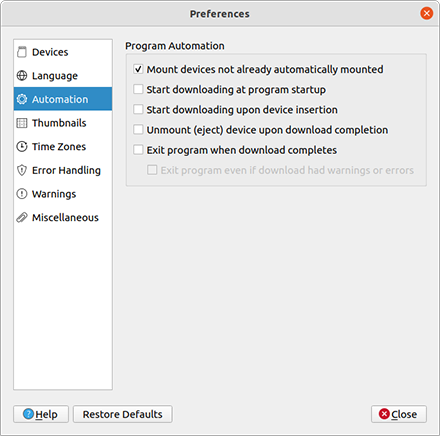 4Set the option Unmount ("eject") device upon download completion.